A Dublin coddle is a dish with pork sausage and rashers cooked with potatoes and onions as a stew or soup. 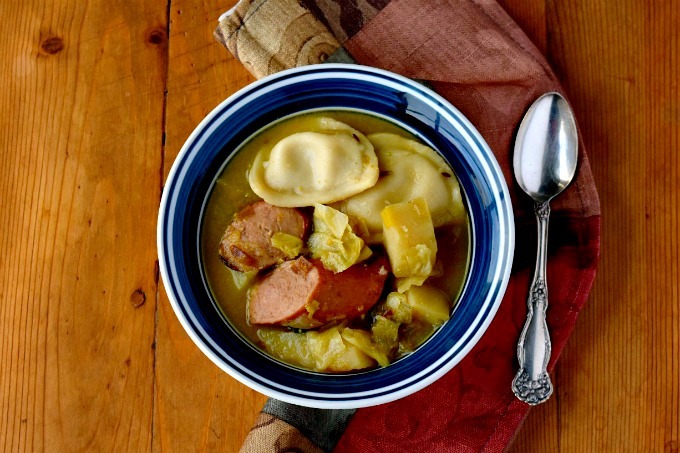 My Polish Coddle uses kielbasa, potatoes, and onions topped it with mini pierogies. Sometimes I have an idea and the hubs reads the menu out loud sort of questioning the recipe title. He did just that with this recipe. And I’m sure you’re sort of doing the same thing. I bet y’all don’t even know what a regular coddle is, and no I’m not talking about eggs. Because you can coddle eggs, too. To be honest, I didn’t know much about it either. I stumbled on it when I did a Pinterest search for sausage recipes. 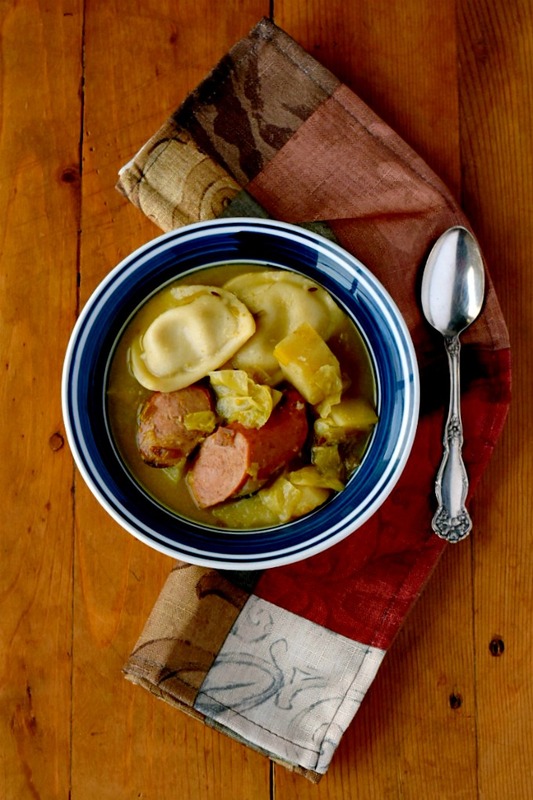 Since I always have some kielbasa in the fridge, I was looking for something different to make with kielbasa and the box of frozen pierogies I had in the freezer. There were sheet pan recipes, skillet recipes, recipes with pasta, rice, you name it. But something about the coddle recipe just stuck with me. The idea spun around in my head for quite a while before I decided how I want to try making it. An Irish or Dublin Coddle is salty, thick cut bacon and sausages simmered with potatoes and onions usually in a Dutch oven. Coddle is one of the traditional dishes of Ireland, more associated with Dublin, that’s not only comforting, but easy to make and with inexpensive ingredients. Ingredients such as kielbasa in my fridge and potatoes and onions in my pantry! 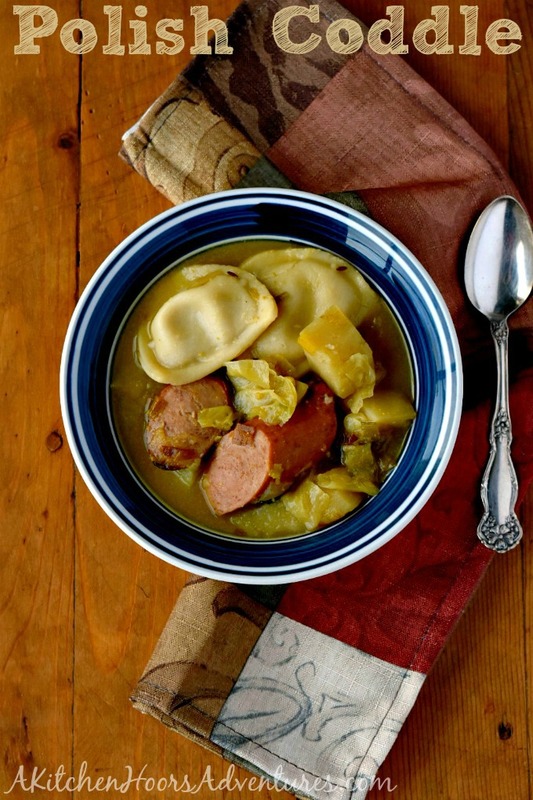 We usually make what we call Polish Dinner with kielbasa, that I have not shared on the blog already. I can’t believe I haven’t shared that one. I must remedy that. I’ve shared a Lazy Polish Dinner, Beer Braised Sausage and Kraut, Kielbasa and Sprouts Hash, and Polish Sausage Tacos. Why yes. Yes we do like Polish sausage in our house. How could you tell? I love the flavors in Polish Dinner. However, I’m not a huge fan of the sauerkraut so much. Since the hubs likes that I keep it in there. For me, I love the mustard, leek, onion, and potato blend that simmers with the sausage. Those are the flavors I love in that dish, so I decided to put them in this mash up dish. This is the second attempt at making this recipe. I thawed the pierogies and cut them in half. Not a good idea. I chopped the sausages into slices, which sort of got lost in the rest of the ingredients. I wanted the sausage to be the star along with the pierogies. So, this time, I chunked up the sausage, added some cabbage, and put the mini pierogies on top to steam and voila! Polish Coddle is born!! It’s simple, hearty, and full of delicious flavors that your family will truly love. Not to mention the ingredients are so frugal that they will easily fit into any grocery budget! It’s also a great “go to” meal when your planned goes all wrong. Please tell me that happens to everyone at some point? You forget to take the chicken out. The bread you thought would be okay isn’t. The lettuce is slimy. You have absolutely NO energy to cook dinner. You completely forgot to buy tomatoes. These are all things that have caused me to order dinner. If I had these ingredients on hand, I could easily make Polish Coddle and not only save money, but have a healthier dinner for my family to eat. And honestly, who wouldn’t want to eat that? 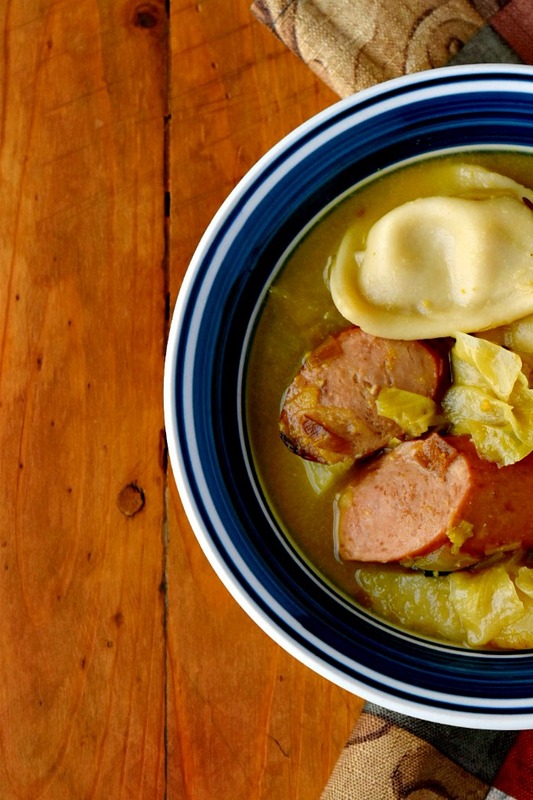 Those chunks of sausage sitting there with the pierogies on top, potatoes, leeks, and cabbage underneath all swimming in a flavorful broth. It’s like colecannon met bigos (traditional Polish stew with sauerkraut and sausage) and invited pierogies over to top off the night. Flavor upon flavor stacked with a little more flavor finished off with a big bowl of comfort; Polish Coddle. What’s your favorite “go to” meal when your plans go awry? Heat a Dutch oven coated with cooking spray over medium high heat. Saute the onions, leek, and cabbage until they begin to soften; about 3 to 5 minutes. Stir in the potatoes and kielbasa. Continue to cook until the kielbasa begins to brown. Add the chicken broth, garlic salt, pepper, and caraway seeds. Top with the pierogies and bake at 350 for 30 to 35 minutes or until the pierogies are cooked through. Serve with crust bread or, better yet, soda bread! Thanks for catching that! Since they’re baked in the oven, they don’t need to be par boiled. What a great warming comfort food dinner! Thank you! It truly is and one that I may have to make week after next when we’re supposed to get snow! Brr!